Friday morning we headed down to the western end of Baldwin Beach for a little fun in the sun and some quite time with only a handful of other beach goers. 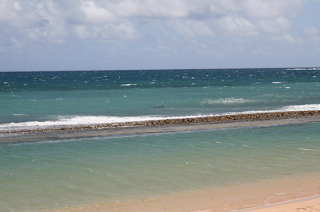 Although it can get quite windy here and you can get sandblasted at times, it's a good north shore beach to visit because of the "kiddie pool" that is created from a long reef wall. 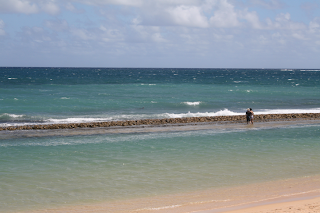 It provides a good place do a few laps without the choppy water, especially when the tide goes out. 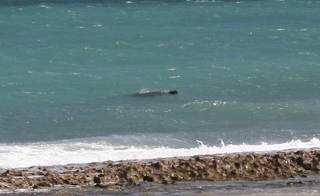 While there we spotted a Hawaiian Monk Seal swimming just beyond the wall. John and I have seen monk seals many times o Kaua'i, but this was our as well as Gabi and Larry's first sighting on Maui. It was hanging around the entire 2 hours we were there. Gabi and Larry on the wall becoming one with nature. WOW - I have never seen one in all my years on Maui!! Amazing. Is this where you park on the red dirt, driving past all the houses to reach it? We call it Country Club or "Camp 1" and our family used to go there all the time for get togethers. 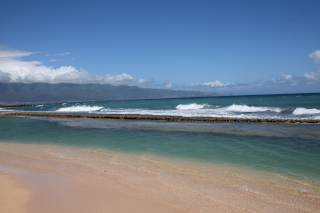 Beyond the reef is where my cousins and husband paddled out by canoe and scattered my mom's ashes. Yes that is the beach. 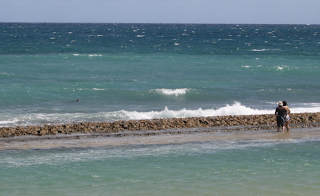 It's a wonderful place for your mother to rest and be entertained by the seals and turtles.